Meet Larry and Carlos – Sha-pow! Larry: A heavy set man, in his mid-late 50s, with a great big gap-toothed smile, thinning grey hair, and glasses. Sort of a younger, unbearded Santa Clause type. Carlos: A smaller, spry squirrely Italian man, dressed in a white tuxedo shirt and black pants. Angular, very expressive face with sad eyes. Larry is one of 10 children.. He has 4 brothers who are Navy Seals, one who is a hit man for the government, and one who is a three star general. Another of his sisters is a drill sergeant, and apparently she’s one tough cookie. He has 3 daughters, a son, and 3 sets of twin grandchildren. I’ve diagrammed what I know, in order to make it simpler, of course. His hitman brother apparently has killed over 70 people for the US government. One good reason to be nice to Larry. 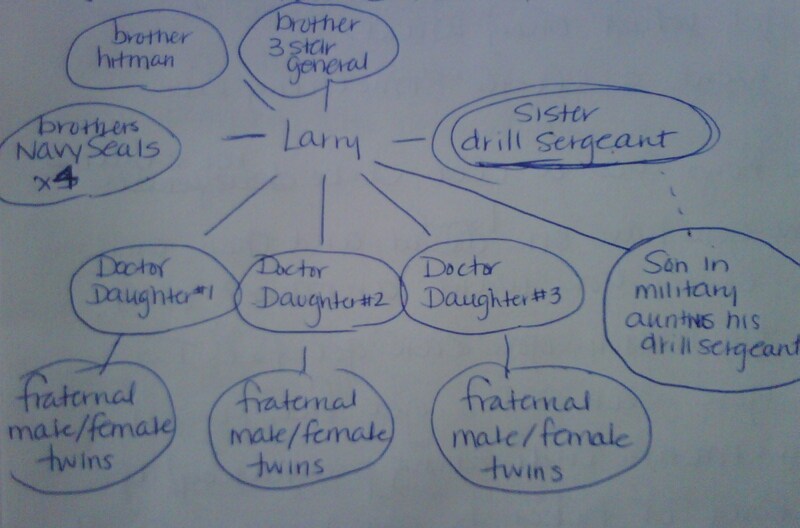 Larry’s son went into the military as well, as you can see. “I hit the jackpot!” he told Larry when he found out that his aunt was to be his drill sergeant. Then she sent him on a 15 mile hike to buy some bread. When he returned, she was irate that he and his crew had retrieved white bread instead of wheat, and promptly sent them all back for a second 30-mile roundtrip errand for the proper item. He’s been home for 7 years and still won’t speak to his aunt. Guess he didn’t hit the jackpot after all. Now, normally, I would have interjected here that either one is a respectable choice..at the proper time, of course… but I figured the girls were smart enough at that point of the conversation to take what he said in the proper context. We’ll have that discussion later. • He has put 11 people through medical school. • When he visits his grandkids, they all examine him, as they also aspire to be doctors when they grow up. “By the time I leave, I have 20 or 30 bandaids,” he remarked. • His ex-wife was his babysitter. How’s that for an interesting story? I wonder if he’ll be there next week; I couldn’t ask with the girls there. • He lost 6.2 million dollars in stock when Washington Mutual went under. • His formal education ended at 3rd grade. • His favorite singer is Loretta Lynn, and his all-time favorite movie star…ugh… escapes me. I’ll be trying to remember it for the rest of the day. Crapola. • One day, Lisa Marie, as a child, kept running into Larry with her tricycle. She wouldn’t stop, so Larry swatted her with the back of his hand on her diapered, rubber-pantsed bottom. She limped the rest of the day in dramatic protest. Carlos roared over to our outside table, sat down next to Larry, and immediately started telling jokes. I mean, he didn’t skip a beat. I would gladly repeat his monologue if I had understood even half of it. I laughed and laughed, not because of the content, but his spot on, well-oiled-machine type delivery. George Carlin was one of his good friends, (and did a great impression of him as proof) along with Jennifer Lopez. He met them both in Altamonte, don’t you know. Carlos then offered donuts to Larry, the girls, and me. We had just eaten, so we politely declined. At that, Carlos decided he was going to leave, because he had no napkins. “I don’t know why I just told you my life story, “ he said before he walked away. I don’t know either, really. But I’m glad he did. And I’m glad Larry the technician decided to come outside and regale us with his wisdom as well. Do I believe it? Not really, even though he showed me Lisa Marie’s number in his phone and told me he could call her anytime he wants. Part of me hopes every bit of is true. I love people. And their stories. Somehow those 2 hours and those 2 men made me better. Kate wrote about the experience too. Here’s her version. I like it. So there ya go. Good day.